Back in April, we enjoyed going to the Carrboro Century Center for their film showing, $4 including popcorn and drinks. They continue tonight with a double billing of Sacagawea (Rolf Forsberg, 2003; "explore the life of a brave Indian woman who guided Lewis & Clark through the American frontier wilderness. Her legend will captivate you with its adventure and multicultural point of view. 60 minutes") and Thrill Ride: The Science of Fun (Ben Stassen, 1997; "computers take us on the Wild Side. Filmed for IMAX, this is a wide screen experience about dreamers who think up these rides and engineers who build them. This movie will entertain and thrill you. 40 minutes"), which we're thinking of going to. We haven't yet this year been to the NC Museum of Art summer films on the lawn, due to conflicts with other events, but I do have Mad Hot Ballroom (July 14) and Neil Young: Heart of Gold (July 21) on my calendar for next month. Another good choice for tonight would have been the free 7p modern ("company premieres its site-specific work, which explores the elements of air, water, and earth and incorporates the outdoor art installation Picture This) at the art museum; it is followed by a (not free) film, Wallace and Gromit in The Curse of the Were-Rabbit, that I am not particularly interested in. Also today, we're hoping on going to attend my friend Glenn's private "Goatstock" party. He is a drummer and has been hosting an annual get-together in horse farm country of North Raleigh on the property of his ex-landlady's, and asks musicians to bring their instruments; my wife may play sitar. However, I'm wondering if he'll have to postpone or cancel if we get the thunderstorms that may come through. We ended up having an even richer day than we had planned, though we sacrificed seeing the two documentary films - and instead saw a current documentary film I've been anxious to see. We did make it to "Goatstock", but the turnout was very low and we could only stay an hour or so; music hadn't yet begun, but we enjoyed seeing the peacocks, goats, and horses there. We have a good Brazilian friend who invited us to an annual celebration of St. John's Festival (Noite de São João, celebrated at night with fireworks with people dressed to joke about how "country bumpkins" look) at Duke University's International House, which we enjoyed in the early evening. There was good traditional food, lots of great company exhibiting the kind and fun demeanor I saw practically everywhere on my visit to Brazil in 2004, and fun dancing and games. + I knew I had to see the film - and especially hope that many others not part of the environmental movement will, as well. I went into the film expecting it to be important to see, but rather dull, watching Al Gore give a slide show. I was wrong! I found the film moved right along, and the presentation materials did a great job explaining Al's points. - We have to be careful, regardless of where our politics and views lie, in accepting blindly what politicians tell us. I am certainly sympathetic to the message, but would prefer to have information well referenced. Obviously the film can't include footnotes, but I didn't see such references in the companion website, climatecrisis.net. Hopefully, his book of the same title has good backup of his claims. - To Al Gore's credit, he mentions in interviews that there is bipartisan support for doing something about global warming. However, if he mentioned it in the film, I missed it. He does say that the issue is non-partisan; I think his case could be more strongly received if he made the bipartisan support clear and tipped his hat to people of different philosophies and political parties making good change happen. - I think it undermines his message a little in referencing the controversial Michael Moore's Fahrenheit 9/11 film. I enjoyed that film and hope that Moore's claim to back every fact up is not just arm waving. But it's clearly easy to perceive that film as having a political agenda. 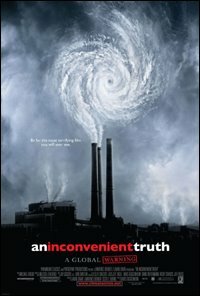 I think that the filmmakers of An Inconvenient Truth used footage from the inauguration of George W. Bush from Fahrenheit 9/11; if I'm correct, surely they could have found many other sources. + (and this is a key point and the biggest plus) Al Gore tells a very important story that we all need to know about. It's amazing to see the magnitude and speed of havoc being caused by global warming, even to see some glaciers melting measurably over the course of days. +/- Al Gore does a great job communicating in clear language. His slides are great, assuming they are factual. But he should make it clear that he is a mouthpiece and that the technical work is being done by well-trained scientists. - I have heard some criticism that there is a strong message that things are not going well, but not enough is said about what we can do and how we can have hope for the future. Having seen the film, I don't think the criticism is fully justified, as Al does briefly go through a list of things that we as individuals can do. It's all very quick, but one thing that did stand out was his showing the impact a few key items (vaguely described, granted) could have on the CO2 buildup. He also refers folks to the film's website, climatecrisis.net. However, this material is presented almost as an afterthought and could definitely be better developed. - He doesn't once mention vegetarianism; choosing a plant- over a meat-based diet is one of the single biggest ways that we can positively impact the environment. o There was a group, Clean Energy Durham, there handing out flyers about what we can do. Hurrah! I hope to network with them and see if we can share some energy between the Triangle Vegetarian Society that I lead and them. We should probably be handing out material at the film showings as well, such as my flyer on environmental justice. o It's difficult to rate this film on a scale of 1 (awful) to 10 (excellent). Using the (obviously subjective) metric of how much I enjoyed the film and based on my imdb site, I would probably give it a 7.5 rating. Great review of the movie, I agree, particularly about the point regarding the huge negative impact of factory farming on the environment that should have been mentioned. Hope to see you and Sangeeta when we return in October! Thanks for the comment. We enjoy reading about your tour, and look forward to welcoming you back!